I was born in Claremore, Oklahoma, on October 13, 1920. Daddy was Ira Elmore Burd, and Mama was Chloe Hendrickson. Our family moved to Kansas in 1927 and lived at Vasaar, Osage City and Miller until 1928 when we moved to Lebo. I attended Lebo Schools. I had two sisters and five brothers. One of my favorite childhood stories was about my brother, Clifford, and me. Daddy sent Cliff and I to the well to get the milk and butter out of the well. I had hold of the bucket’s rope and was goofing around and dropped it. Daddy started spanking Cliff but I didn’t admit it. Why should both of us get spanked? Next time we got in trouble, I’d take the blame. That “next time” never came. I married George Dean Busboom (Dean) on March 6, 1937, in Ottawa, Kansas. We lived in Lebo most of our lives. We have three children: Yvonne (Vonnie) born on Mama’s birthday, October 18, 1937; Gary, born on Dean’s birthday, June 7, 1942; and Vicki born on January 14, 1953. We farmed approximately 1,000 acres and had livestock herd of cattle, hogs and sheep. Later, we ran two lime trucks, spreading lime on our ground and then later for neighbors. The business grew until we were spreading lime in the surrounding communities for many farmers. I drove my own truck with Dean’s dad as my copilot over many miles and bumpy fields. I also worked for ten years at Allegre Rexall Drugs in Lebo. I enjoyed quilting, crocheting and other handiwork. I have always been an active member of the Lebo Baptist Church. After retiring, we spent ten winters in South Texas, fishing and sightseeing. Dean suffered a major stroke in 1983 and was left pretty much handicapped until he passed away in 1990. In 1999, I married Robert Spatz, a Lebo native. Bob enlisted in the Air Force in 1941 and served in World War II four years. He was stationed in California, Washington, Puerto Rico and Guam. He then worked in Kansas City for General Motors for 25 years and retired in 1975. We have done a lot of traveling. We have been to Hawaii to visit his brother’s graveside. We also flew to Puerto Rico, bored the Sun Princess ship and cruising through the Panama Canal to South Africa, and flew home from Costa Rica. We also made several short trips with our Travel Club. Bob passed away in 2013. Vonnie lives in Wichita, Kansas. She is married to Garold Hodges, a Lebo native. She graduated from Kansas State University. She gave private piano lessons for 56 years and retired in 2007. They have three girls: Connie Hodges McCormick, Cyndee Hodges Cummings and Cathy Hodges McGuire. She has two grandchildren and twin great-granddaughters. Gary lives in Keller, Texas. He is married to Donna Lane, another Lebo native. Gary worked for Santa Fe (now BNSF) railroad for 42 years and retired in 2004. They have four children; Roger, Randy, Stacie Busboom Hembd and Ryan. They have eight grandchildren and three great-grandchildren. Vicki lives in Lebo, Kansas. She is married to Dennis Rosine, yet another Lebo native. She graduated with both bachelors and masters degrees from Emporia State University and teaches elementary school in Lebo. This is her 40th year of teaching. They have two children, Brandon and Bryon. She has four granddaughters. I lived in Assisted Living at Emporia Place for two years and at Reed’s Cove in Wichita for another year. My family has always been so very special to me. We’ve had lots of fun Christmases and birthday gatherings. I can’t wait to see them all in Heaven. To send flowers or a remembrance gift to the family of Caroline B. Busboom Spatz, please visit our Tribute Store. 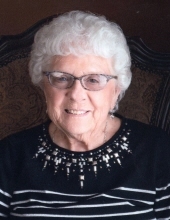 "Email Address" would like to share the life celebration of Caroline B. Busboom Spatz. Click on the "link" to go to share a favorite memory or leave a condolence message for the family.